3.1.4 Meier has no access to Scientific Information? In the FIGU literature (contact notes, books, booklets, letters, periodicals. etc.) a lot of information is published regarding global political, military, cultural and historical events, scientific facts, discoveries and inventions that range from the historical past, the present and very far into the future. It has been claimed by some Meier case investigators, supporters, various FIGU groups, Meier case representative-Michael Horn & even by Meier himself that some of this information about global events, prominent persons and new scientific theories and discoveries were known and published by Meier/FIGU before the events/discoveries occurred. This information is allegedly obtained by advanced capabilities of extraterrestrials, who then relay this information to Meier or by Meier’s own prophetic capabilities. These are obviously, capabilities that are unknown, unexplained and/or not accepted by contemporary terrestrial mainstream science. Below are some examples of FIGU publications which contain specific claims made by either Meier or members of FIGU regarding the alleged accuracy and fulfillment of various prophecies, predictions and probability calculations. “What other material do you have as evidence? On the 14th of October, in our most recent private conversation, you mentioned, in regard to the predictions, that you would deliberate about whether such predictions should continue to be made or not. So what is the corresponding conclusion? (…) But now still a question related to the earlier predictions: surely, also with these, you knew from the very beginning – as in the case with the US government – that all of you, and I, have made predictions and probability calculations which were unheard and unnoticed, like screams in the desert which remain and produce no echo. We knew that. That is right, yet because of your constant insistence we agreed, and over the decades we made it our duty to undertake the fathoming for predictions. Additionally, we also thought that we perhaps erred with our probability calculations, and the predictions and calculations could indeed bring about something with the Earth human beings – that they would just prick up their ears and at least change certain serious things, or even prevent them. All of our hopes, however, were a serious delusion to which we had succumbed, because the majority of the Earth human beings are so narrow-minded and high-handed that they build only upon their own unintellect, their own irrationality and illogicalness, and therefore they disregarded all warnings and good advice. In truth, there are, in all the countries of the world, only minorities who know how to profoundly use their minds, their reason and their logic, and who are willing to turn to the reality and its truth, and also to learn, to understand and to implement the creational-natural laws and recommendations. The majority of the people of earth are responsible for most of the catastrophes and loss of life because they do not pay attention to Meier’s warnings which were published by him since the 1940’s. Many prophecies, predictions and probability calculations (will be further mentioned as PPP) concerning various scientific, economic, military and political developments on Earth were published or forwarded to leaders of the world, governments, newspapers, magazines, radio stations, TV stations, various organizations and many private persons worldwide but the entire effort did not achieve anything, which makes them responsible for all the destruction, death and suffering. Until Meier’s PPP are fulfilled, his claims will be vehemently disputed by enemies, pathological know-it-alls and critics who dismiss them as swindle, lies and fraud. The accuracy of various Meier’s PPP will undoubtedly and unequivocally prove that Meier has an extraordinary source of information to which no other people have access, which is the Plejaren and/or his own extraordinary prophetic capabilities. The contact reports are seriously being studied all over the world including UN and Vatican, and especially by scientists and researchers which stimulates scientific research and development and leads to valuable insights. New (scientific) discoveries are often published in newspapers and magazines, as well as on radio and television only days, weeks or a few years after Meier/FIGU published it first. It turns out that it is useless to provide and publish PPP because the majority of the people of the earth does not concern itself with them, does not care and cannot be educated even when they recognize the truth of the PPP. The Plejaren will stop giving predictions any further because despite publishing many predictions, Meier and the Plejaren achieved no success. Nevertheless some important matters concerning the people of earth will be shared by the Plejaren from which earth people can come to know that Billy and the Plejaren are aware about the future. Any reasonable person going through such claims as made above by Meier/FIGU would be astounded and shocked at the logical consequences and global implications that follow from these claims, which is that Meier is indeed in contact with ETs or that Meier has the ability to accurately forecast the future, both of which didn’t attract the attention of the majority of the people of earth including scientists/academics, experts, philosophers, policy-makers, writers, journalists etc. So it is incumbent on all of us to really look into it, analyse, verify and, if proved to be genuine, act upon the prophetic and predictive information allegedly published by Meier since the 1950’s. Before directly jumping to the investigation, first we need to familiarize ourselves with some concepts, structures, methods, functions and purposes for the publication of alleged PPP, which are explained below, in order to accurately assess the validity of the claims made so far by Meier/FIGU. Voraussage (prediction) – a statement about what will happen with certainty. Prophezeiung (prophecy) – a statement about what could happen if no deliberate steps are taken to change the course of events. Wahrscheinlichkeitsberechnung (probability calculation) – a statement about the probability that certain things will happen based on the laws of cause and effect. Berechnenden kombinatorischen Sehens – prophecy through combinatorial calculations. Zukunftsreise (traveling into the future) – time travel into the future by technical means to witness future events etc. Zukunftsvision (clairvoyance) – a vision of the future, appears in pictures as an ‘inner vision/voice’. Zukunftstraum/Klartraum/Wahrtraum (future-dream/clear-dream/truth dream) – a dream by which a “glimpse” etc. of future events is percieved. Meier allegedly uses any of the above mentioned methods in order to forecast future events. The alleged Plejaren & other ETs also uses the same methods, the results of which they then convey to Meier who in turn publishes the information. Furthermore it is claimed by Meier that highly evolved Spiritual Entities (beings who are are billions of years ahead of us in evolution and have evolved beyond the need for a physical body into the so called Arahat Athersata & Petale levels) telepathically contacted him and transmitted information about future events which also were published by Meier. It has been mentioned by Meier/FIGU, that the meaning of the words ‘prophecy’ & ‘prediction’ must be understood in a fundamentally different way than is usually denoted in religious, historical & contemporary literature. Some references will be provided below where the distinction between prophecies & predictions is elaborated. Whereas the probability calculation, as mentioned earlier is a stating that considers the probability of how things will be developed, based on cause and effect. Many of the persons studying the Meier case, even among the FIGU groups, assumes that there is a clear distinction between a prophecy and a prediction. In a way they are right but not entirely. In Contact Report 17, Friday, May 9, 1975 (Plejadisch-Plejarische Kontaktberichte Vol 1, pg. 147, 2002), the alleged Plejaren woman Semjase explains the difference between two types of predictions. These two types of predictions are distinguished based upon the method that is used to predict the future events. In the first type, the prediction is made with the help of material-consciousness or let us simply call it as consciousness (though according to Meier, a human being has both a material-consciousness and a spiritual consciousness). This type of prediction is called a ‘direct future view’ or simply a ‘future view’. In the second type, the prediction is made with the help of complex combinatorial calculations. 75. We know two possibilities to see the future. 75. Wir kennen zwei Möglichkeiten, um die Zukunft zu sehen. 76. One possibility is that we material-consciously (materiell-bewusstseinmäßig) travel into the future and observe the events of that time on the spot, as I’ve done with mister Jacob. 76. Die eine Möglichkeit ist die, dass wir materiell-bewusstseinmässig in die Zukunft reisen und die Geschehen der betreffenden Zeit an Ort und Stelle beobachten und registrieren, wie ich dies z.B. bei Herrn Jacob getan habe. 77. This type we call direct future view. 77. Diese Art nennen wir die direkte Zukunftsschau. 78. The second possibility is that of calculating combinatorial Seeing, as is partially practiced with you and is known by the wrong name or the wrong description CLAIRVOYANCE. 78. Die zweite Möglichkeit ist die des berechnenden kombinatorischen Sehens, wie dies auch bei euch teilweise betrieben wird und unter dem falschen Namen oder der falschen Bezeichnung HELLSEHEN bekannt ist. 79. This kind of future view is also with us uncertain and imperfect and does not rule out faulty observations and faulty descriptions. 79. Diese Art Zukunftsschau ist auch bei uns zweifel- und fehlerhaft und schliesst Fehlbeobachtungen und Fehlbeschreibungen nicht aus. In the book Prophetien und Voraussagen (1982/1996, German) on page 6 (1982 edition) or page 4 (1996 edition), the distinction between prophecy and prediction is explained. An official English translation of that text is reproduced below, taken from the pages 40-41 of the booklet 49 Questions (1986/1992/1996/1997/2000). 47. What is a prophecy, what is a prediction ? The following must yet to be explained with regard to prophecies and predictions: Predictions are a form of foreseeing the future through extremely extensive, cabbalistic calculations that lead to very accurate results. Another possibility would be to investigate future events through various types of time travel into the future. This would very clearly show that predictions do indeed come true with absolute certainty, without a possibility of undertaking any changes or thwarting the event. Predictions are based upon the logical consistency of established facts, from whose origin and progression must come forth a very specific result. Prophecies, on the other hand, are very different, for, as a rule, their function is to simply warn of coming events, and their goal is to reveal with certainty what will transpire unless changes are wrought in time. Provided the change fails to come about, the prophecy then turns into a prediction that will invariably fulfill itself. Therefore, one must reflect on the fact that prophectic statements and announcements can actually be changed depending upon humankind’s behavior. Thus, no guarantee exists that a prophesied event will take place if positive change can be brought about through a beneficial evolution. Events forecasted as prophecies, probability calculations or as ‘predictions resulting from complex combinatorial calculations’ do not necessarily have to happen (entirely) as described, depending on whether or not action is taken to avoid the described events from happening. Predictions made through either future-viewing (with the aid of consciousness) or physical time travel (with the aid of technology) will occur with absolute certainty. “Prophecies are many times completely misjudged, particularly by people who are very religious. And they are of the erroneous assumption that prophecies are determinations or commandments by supernatural forces, or even by “god” forces. This, of course, is not the case under any circumstances because a prophecy is nothing more than an announcement or pre-announcement of events to be expected in the future. A prophecy is not intended to put any feelings of fear or panic into human beings. Rather, prophecies announce future negative events and are intended to serve as warnings. This offers human beings an opportunity to take the required countermeasures in order to greatly reduce or prevent the prophecies from taking place by their own hard work and efforts so that they are possibly averted. And due to the fact that they are always warnings, as I have just mentioned, it would only be logical to assume that these are negative events that are being announced. It would be totally paradoxical to announce positive events and to want to influence them in a negative manner. Therefore, this explains why prophecies, without exception, contain negative announcements, because only negative in an excessive form needs a change back to the normal positive state in order to balance everything again. Through the necessary positive influences of thoughts and actions, therefore, negative events can be prevented before they occur, thereby fulfilling the purpose of any prophecies. Extremely detailed data could lead to fear and panic. Absolutely necessary evolutionary steps must not be skipped to evade unpleasant, harmful experiences. For instance, the evolutionary process would be incomplete if one did so. One very important and very serious reason why prophecies must not be made available in a completely clear form is that through precise and advance knowledge of certain facts, monumental destruction and catastrophes could be generated, and they would be triggered by the excessive feelings of fear, hatred, envy and other such things of all people who have become aware of the negative events that lie ahead. Another very serious reason is the fact that the majority of the earth population at this point is not capable of understanding, consciously assimilating and dealing with the full extent of a prophecy. Many people believe they would be prepared to deal with such detailed prophecies, but it has been shown that most people would not be capable of handling the detailed knowledge. Therefore, coding must be used as a safety measure to avoid that the still unwise human being is not harmed in his or her consciousness by this premature information. Relatively few people are capable of mastering encodings of a text and to truthfully understand and handle them. Of course, it is never the prophecies, or even the prophets themselves, who are producing these announced catastrophes, wars and evils of all type among humanity. The human beings themselves determine their own fate through denial, lack of knowledge and lack of obedience to or observation of the laws and commandments of Creation, subsequently triggering these negative events. So if prophets announce unpleasant, horrible things, this signifies that the human beings in general are in a low developmental stage and a new standpoint must be discovered in order to prevent the fulfillment of the prophecy. Prophecies, as are now given on earth, can only be “diffused” if every single person is immersing him- or herself in the laws and commandments of Creation. If those prophecies are not heeded, as is the case now and has always been on earth, no changes for the positive will take place. If man’s thinking, actions and activities are not improved, then a given prophecy becomes a “prediction”, which is a fact that cannot be avoided and will fulfill itself with all its consequences. And this will continue to occur until the human beings on earth are willing to climb off of their high horse and find it appropriate, in their arrogance and rebellion, to take the offered prophecies seriously and act accordingly. Any announcements related to cosmic events of any type do not fall into this category of prophecies because universal forces are entirely separate from human beings who have no power over such cosmic forces. An example of an encoded prophecy is the following ‘Petale Prophecy’ (telepathically received by Meier from the Petale spirit level) written down by Meier on Wednesday, February 4, 1976, 6:10 AM and also recited in Contact Report 115. As you can see, there are no direct references to any specific locations, events and dates in the prophecy. in the south of the land of the old native inhabitants of America. as well as the land where black humans hope. for also there, under the land, lives hell. and also from the lands with the boon of Earth-gold. and the city at the fault becomes totally buried. “249. It must still be stated that the Russian attack will occur during the summer, in fact, starting from Arkhangelsk. Denmark will not be dragged into the war, due to the insignificance of this country. However allegedly there are some instances where Meier may have passed on the information about future events to his FIGU Core Group members. This page – Informing FIGU CG members on Prophecies & Predictions – documents all available instances, where this authorization was mentioned in the conversations between Meier and the Plejaren. As mentioned in the beginning of this page, a lot of information is published in the FIGU literature regarding global political, military, cultural and historical events, scientific facts, discoveries and inventions that range from the historical past, the present and very far into the future. In our research, we have analysed each claim separately to the best of our abilities and presented the results in the end section. How were the Contact Reports written down by Meier? How many Contacts Reports were written down by Meier so far? What is the earliest verifiable publication date of these Contact Reports? How many editions of the Contact Reports are there? How, why and when were these Contact Reports edited and disseminated? Go to the – CONTACT NOTES & EXPLANATIONS – section for answers to all of these questions and more. Answers to other questions related to the publication of prophecies, predictions & probability calculations are also provided there. “Of course also regarding the predictions from ‹BEAM› there are critical voices and allegations of forgery. As usual with this possibility of proof, he is also being accused of fraud and desire for fame. However important matters are to be considered regarding the prophecies and predictions. Even when he gives certain statements about future events to the core group members within the FIGU, if at all, he mentions them in a very short notice and, contrary to the opponents accusations, he doesn’t extensively talks about it in order to elevate himself. Contrary to opposing voices, a forgery of the statements and prophecies in the contact notes by ‹Billy› Eduard Albert Meier is highly unlikely and even impossible. On one hand, namely, the official contact notes with the extraterrestrials are being strictly numbered and read by the core group members, and on the other hand, the contact conversations always stay in relation to each other in any form. It is thus impossible for ‹Billy› to subsequently insert any fictitious contact reports. Any subsequent manipulation of the contact reports would in the present scope of thousands of pages of contact conversations require an unimaginable and relatively enormous and extensive effort of necessary comparisons, changes, additions and adjustments, that it could not be done by ‹Billy›. In addition he would become untrustworthy by such manipulations towards the core group members and the readers of his books and writings, because they usually know the publications. Requirement of a malicious forgery would also be that ‹Billy› would have a super memory and would have the contents of several thousand pages in his head. To make it even more difficult, Billy had no possession of a computer in the year 1984 because the PC simply didn’t found the way to his office until the year 2002. ‹Billy› however persistently wrote down the contact reports with a mechanical typewriter until 2002 and refused to use a computer, despite suggestions of the group members. A forgery of the contact reports and the prophecies would also have meant that he would have had to make countless of written pages of text with gaps with the typewriter to insert the supplements later. Since in case of a forgery he could not have known to which events he should refer in which contact report, it would also not have been possible to determine the free place for the supplements. Besides, it is generally known that by insertions the text could move over multiple pages. Counterfeit or subsequent insertions would have meant that he would have had to rewrite countless of already present pages multiple times with the typewriter. Given the fact that he has already written or published 3 novels, 1 fairy tales book and more than 35 books, in addition to over 360 study booklets for spiritual teaching, the many information and pamphlets, the contact reports as well as bulletin- and WZ-articles, it can be assumed that he would have hardly found the time necessary for these manipulations and forgeries on the contact reports. Furthermore it has to be noted that any falsification or subsequent insertion would mean the retraction of the existing contact reports that were already distributed to the group members, which would not have been possible without critical voices within the group and also is not feasible. The fact, however, is that apart from spelling corrections that have been clearly stated, no manipulated copies of the contact reports exist. His first copies of the original contact reports still exist and can be examined by the group members. “Billy, of course, obtains information about the ongoing climate and weather changes and also how the tremendously negative and disastrous effects faster and more spread over the earth, and indeed conjured up and caused by the ever more and more rampant overpopulation and the associated globalization through which all destructive impact on the planet , the fauna and flora , all of nature and to the earth humanity itself . Also the Unstoppable which was declared that a global macroeconomic and financial destruction is in progress , which banks, companies , corporations , cities and states are ruined. Also, diseases and epidemics such as AIDS and BSE etc. were predicted and much more. Some of the claims made by the FIGU Core Group members Hans-Georg Lanzendorfer (HGL) and Pius Keller in their 2005 and 2014 articles are quite contradictory to that of Meier’s own claim, which is that the information (that is incorrect) in the contact reports have not only just been corrected for spelling and grammar (as HGL suggested) but again and again new information, of both ordinary and prophetic/predictive nature, has been added and old information has been modified, replaced or deleted. This has of course led to a great deal of changes in the amount of information and the numbering of the sentences in the different editions of the Contact Reports that were published over the years, as a simple side-by-side comparison of most of the contact reports from different editions and sources reveals. For example when the number of verses were compared* between the 2nd edition contact notes Semjase Kontakt Berichte (SKB) and the 3rd edition Plejadisch-plejarische Kontakberichte (PPKB) volumes, for the contact reports between 1 and 517 (50 contact reports, i.e. between 353-372 and 402-433 are excluded, since the SKB volumes with those contact reports are not available with us), the difference is at least 5,976. That is, at least nearly 6,000 verses or sentences have been newly added to the 3rd edition PPKBs. This doesn’t necessarily mean that each and every instance of modification or editing of information was done intentionally to postdict or retrodict in order to manufacture/hoax a “corroborated” prophecy or prediction. In few instances, it could be just due to printing errors that are not important with regard to the evidence for the case and at other instances new information was only added after the PPP events were fulfilled, which then wasn’t concealed by Meier/FIGU and for which reasons were given. In the next section, however, several examples where Meier case supporters would claim that a PPP has been corroborated, we have demonstrably proved that the PPP information in the Contact Reports has been edited or inserted (often with different verse numbers), which refutes HGL’s claims thereby supporting the retrodiction or backdating hypothesis. A more critical aspect that is obvious in the Contact Reports is that only the sentences of the alleged Plejaren are numbered, while Meier’s are not. This means that, Meier/FIGU could edit just the sentences spoken by Meier without changing the verse numbers for the sentences spoken by the Plejaren. In the light of such possibilities, the need for cross-checking each edition of the FIGU publications is paramount. Following is a correspondence letter between Billy Meier and one of the main investigators of the Meier case-Wendelle Stevens from March 1995 (Source: Message from the Pleiades, Vol 4, 1995, pgs. 402-404) on the subject of errors or mistakes in the original German Contact Reports (first edition) which were then subsequently corrected and printed again in new editions (second edition). As you can see, what Meier had disclosed to Wendelle seems to contradict the claims of FIGU Core Group members HGL and Pius Keller and also Meier case representative Michael Horn, thus proving that the efficacy of the so called foolproof authentication system, which was supposed to ensure the integrity of the Contact Reports, as a failure. But even if the numbering system and the content was completely identical in every edition, one can ask if this really matters at all. The only thing that really matters when it comes to proving a PPP is WHAT information was published WHEN, regardless of any difference in verse numbers or content between the different editions. The verse numbers can only be a helpful system for referencing to information and locating it in the Contact Reports quickly. We might think that since Meier/FIGU found mistakes and errors in 1992 about their first edition German contact notes (Semjase/Eduard Meier, Vol. 1-19, 100 pages each), published between 1977-1981, most errors would be corrected in the the second edition contact notes due to them being checked and corrected by the alleged Plejaren – Semjase, Ptaah and Quetzal in the 1990’s. But as it turns out, the second edition (Semjase Kontakt Berichte, Vol. 1-28, 200 pages each) are also filled with errors which have forced Meier/FIGU to have to make corrections again, with the help of the alleged Plejaren Ptaah and CG member Bernadette Brand, to finally publish a third edition of the contact notes (Plejadisch-Plejarische Kontaktberichte Block, Vol. 1-12, around 500 pages each) from the year 2002 onwards. Are there no mistakes at all in the third edition? It seems like they do contain some mistakes which is why Meier/FIGU have provided corrigendae for some of them, and some mistakes were also being mentioned in the online bulletins published on FIGU website. Meier has no access to Scientific Information? Following are some of the excerpts that claim that Meier has allegedly no access to academic papers, scientific journals, science magazines, popular science articles, television, Universities, public libraries..etc. Before Stevens’s first trip to Switzerland in 1977, Lou Zinsstag had sent him the contact notes pertaining to the Pleiadian propulsion system. But Stevens had never heard the term “tachyon.” Nor had the Elders or Welch. After Welch had read in the contact notes Semjase’s explanation of Pleiadian propulsion to Meier, he questioned the man often about the concept. Welch came away thinking that Meier knew more than he should, both for his station in life and for the dearth of information on the subject in all but the most sophisticated scientific circles. “He wrote down in the notes what he had been told,” said Welch, “and then he elaborated on what he understood of the concept as a method of space travel. I saw those notes in ’78. We did learn later that, for some period of time, specialists either connected with NASA or with companies like General Dynamics had been quietly working on that as a propulsion concept. What’s interesting is that the man who wrote the notes has a formal education equivalent to the fifth or sixth grade. He does not live near major libraries, he does not live near major scientific centers, he doesn’t have immediate contacts in those fields. At the time, we didn’t know what ‘tachyon’ meant. Most physicists didn’t know what a tachyon was. And to apply the concept of theoretical tachyon to space propulsion is a huge step to make. There was no evidence that we could dig up that he had collaborated with anybody on this. “In addition to having an abundance of the best, clearest and still irreproducible physical UFO evidence, Meier has published a voluminous amount of very specific, highly detailed scientific information in numerous fields of study, most of it still only available in German. Thankfully, due to recent efforts by interested parties, more is being translated into English all the time. The ongoing corroboration of Meier’s information automatically occurs with each so-called “new, official discovery” of something Meier had already, verifiably, published. It’s even more compelling because the “discoverers” and the reporting sources are consistently unaware that the information was first provided to a “Swiss farmer” by “extraterrestrials”, often decades ago. For the skeptics, who are suddenly compelled to launch serious online searches in efforts to show that Meier is really just plagiarizing already existing scientific information, several problems occur. First, a good deal of Meier’s information was published in copyrighted books and documents beginning in 1975, while earlier documents from the 1950s and 1960s are harder to prove (even though there is an interesting mechanism that may ultimately confirm their authenticity, as well as accuracy, too). When it is said, for instance, that Meier scooped scientists by 23 years regarding information about the moon’s surface, some skeptics will search the internet (certainly not available to Meier or anyone else during the 1950s through 1980s, and even later) and perhaps point to scientists who offered theories that were similar in varying degrees. But even then, such information wasn’t easily available, and with no effective search technology at the time much, if not most, of it only saw the light of day in specialized, often obscure academic papers and/or publications, etc. Though Thomas Welch was not conclusive in his statements, Michael Horn strongly asserts that since Meier has no access to academic papers or publications, scientific periodicals, libraries, Universities or even television etc., according to him the logical conclusion would be that the scientific information he published must have come from extraordinary sources which would support the claim that Meier is in contact with highly advanced extraterrestrials and/or has extraordinary capabilities himself. Michael cites the investigations conducted by the late Wendelle Stevens during the late 1970s and early 1980s published in his two books – UFO Contact from the Pleiades: A Preliminary Investigation Report (1982) and UFO Contact from the Pleiades: A Supplementary Investigation Report (1989), though he didn’t mention on what specific pages did Wendelle mention the above details. We would like to see some citations. Is it true that Meier really had no access to academic papers or publications, scientific periodicals, television etc.? The answer is NO, as becomes apparent from the information published by Meier himself in CR 222. 45. You have given an extensive explanation, which shows great knowledge of the addressed matter. 46. Indeed, you amaze me again and again. It’s all half as bad, for on the one hand, Sfath taught me a lot of knowledge in this respect, but on the other hand, I also learned a lot at school – even though I was a big truant – and moreover, I’m also learning constantly through professional books, professional articles in newspapers and magazines, as well as through professional television broadcasts. And when did Meier first have access to television? Korff and Tina, after returning from visiting Meier’s place, again visited the Schnarwiler bookstore. This time Ruth Wieser recalled that Meier had purchased a series of books called Chronik, which resembles the Time-Life book series, an ongoing release of volumes covering the entire history of a century, one volume per year. The complete Chronik has a total of 99 volumes, covering the years 1900-1999, so Korff reasons that by the time of his visit in 1991 Meier would have possessed 92. Wieser also pointed to Korff that Meier had purchased books on the subjects of “photography, science, astronomy and history” – (pages 94-95). The above screenshot is taken from 18:28 minutes into the video recorded in 2007 by Michael Horn and Jack Gerlach for the documentary The Silent Revolution of Truth (2007), although this footage didn’t make it into the final film. 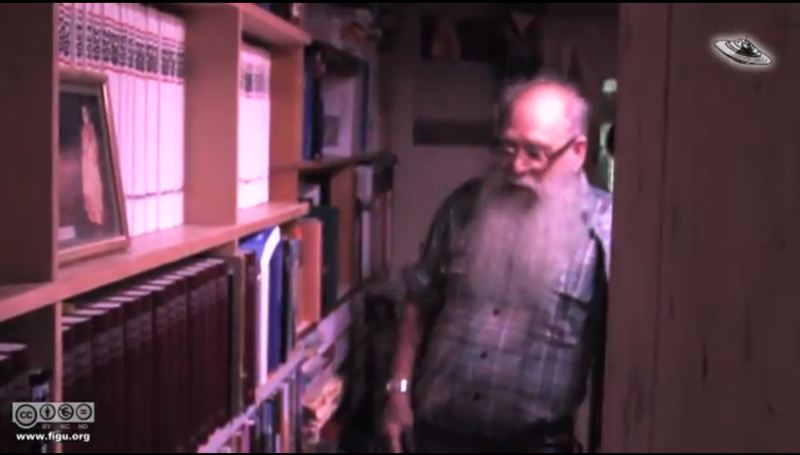 It was published by FIGU on their YouTube channel as ‘Interview mit Billy Meier, Nr.004‘ on August 2, 2012. On the left side in the screenshot we can see a series of white books on the top shelf and a brown set of books on the shelf below it. The white set of books are the Chronik book series which Korff talked about in his 1995 book. The brown books are the ‘Brockhaus Encyclopedia‘. All of the above evidence clearly points to the fact that indeed Meier has access to volumes of scientific information (both historical & contemporary) thereby refuting the claim, which was and still is being frequently used by Meier case supporters & mainly by Michael Horn to defend his corroboration claims. Information that is claimed to unconditionally correspond with past, present or future reality. This contains predictions of which it was claimed they will or would come true with 100% certainty, as well as factual claims about any subject that where allegedly made when the equivalent terrestrial information was not (yet) available. Information that is claimed to be probabilistic in nature. This contains predictions that do not have to come true with absolute certainty. So all the prophecies, probability calculations & ‘predictions that were calculated using probability’, as well as any other information that is probabilistic in nature comes under this category. Keep these definitions in mind as in the analysis section, we have labeled (see below in blue) and investigated each claim made by Meier according to the aforementioned distinction. These labels are also very useful in arriving at conclusions for individual PPP and also for the final grand conclusion (if possible) on this PPP category of evidence. Corroborated Article(s) month 1 year 1, month 2 year 2, etc. The main purpose of creating this distinction is that we can focus more on the claims made by Meier which were either said to occur with 100% certainty or being mentioned as facts. If these claims have failed to occur or occurred differently, then we can say that Meier’s predictions were not accurate or have gone wrong, which consequently supports the null hypothesis – which is that Meier either alone or with the help of others has published information which origin lies neither in extraterrestrial sources nor in psychic abilities but in a terrestrial source, and if any “hits” occur, this is to be explained by any type of postdiction, depending upon the context. Corroborated Article(s) contains the month-year of various newspaper articles or website links published in various FIGU publications (books, online bulletins etc.) that are presented as supportive evidence to Meier’s or the alleged ET’s claims. Please keep the following abbreviations in mind as they will be used often throughout this website. We have based our investigation on the original German material as much as we could, as far as it was still available (books, booklets, periodicals etc. ), since many earlier publications are out of print now. Furthermore we have used the English translations of the Contact Reports provided by Wendelle Stevens in his book series ‘Messages from the Pleiades’, the Billy Meier Wiki – Futureofmankind, the (German) website of FIGU Switzerland, the now defunct FIGU USA website and any other publications related to the Meier case. We have provided (mostly unofficial and unapproved) English translations for the relevant passages. It is possible that these translations contain mistakes/errors and so we highly recommend that you study the English translations alongside the original German material for more accuracy. The analysis of the Meier material presented below does not exclusively only covers claims of corroboration put forth by Meier/FIGU, but also covers many claims in the material that are falsifiable, but haven’t been specifically put forth by Meier/FIGU as being corroborated. Because of the presence of hundreds of Contact Reports, Books, articles,..etc and other reasons that will become apparent, we’ve broken our analysis broadly into 2 parts – Contact Notes and Other Sources. And under Contact Notes, we have further divided it into 4 parts based on the Contact Report numbers. Click on the below links for our analyses of the information published by Meier. In fact, we have examined more than 150 distinct topics, picked up from the above material, covering the likes of astronomy, archaeology, ancient history, geology, biology, paleontology natural disasters, accidents, geopolitics, religion, economy, terrorism, etc. Even though we have analyzed an additional set of nearly 60 other different topics, we didn’t include them on our website because a few of our peers have complained that the findings so far published already appear highly dense and redundant. Anyway, now each of these 150 distinct topics again contains within it several multiple claims of prophecies and predictions driving the total number into several hundreds. In many cases it is understandable that if Meier would indeed have had foreknowledge of certain sensitive information it would not have been wise to publish it prior to fulfillment. Yet, there are also several prophecies and predictions of which prior publication would have been rather inconsequential but would have signified conclusive proof of Meier/Plejaren’s prophetic and predictive capabilities. But no such examples have ever been found or has ever been furnished by Meier/FIGU/Michael Horn that withstands scientific scrutiny, contradicting their own claims, thereby lending much credence to the null hypothesis which simply states that the source of Meier’s information is neither ETs nor his psychic abilities, but the widely available terrestrial sources. The above set of patterns forces us to draw the inescapable conclusion that Meier has simply copied information – either identical or proximate (to avoid suspicion) to the original material – from his vast personal library containing several hundreds of books, popular and science magazines, encyclopedias, newspapers, TV programmes, etc. And also the presence of a large body of erroneous and pseudo-scientific information in Meier’s literature logically rules out the presence of extraterrestrials, who are supposedly thousands of years ahead of us in science and technology and have been conveying prophecies and predictions to Meier. This body of information rather categorically points to his woeful ignorance and poor discerning skills as a result of which, he was unable to distinguish facts from fiction, reliable vs unreliable sources and new vs obsolete scientific findings. This for the most part could be due to his lack of formal education which Meier discontinued after his 6th grade. Some prominent examples illustrating each of the above four patterns are listed under this page – Exposé of Billy Meier’s prophecies and predictions – for convenience for the readers. Some examples are characterized by more than one pattern, but we have simply chosen to place them under only one pattern to avoid repetition. However, one example that would fit all of the the above patterns is the Meier’s prediction of 5,100 year old corpse of the Ice man, also called Ötzi. Around that time, I have directly contacted FIGU and explained them about my idea of creating a website that documents and researches all the pro and con evidence on the case, especially the “fulfilled” prophecies and predictions which requires their assistance. At first they responded to my idea positively, and I was being told that even Meier had a discussion with the alleged ET Ptaah on this that also concurred. But matters suddenly changed when I requested FIGU to provide me with the older editions of contact notes that supposedly contains the “fulfilled” prophecies and predictions in unaltered form. FIGU responded back by saying that they couldn’t help me because, since these older publications contain many errors and printing mistakes, they have literally burnt these books down. And they instructed me to use the latest edition of contact notes that has been published only since 2002. Having become perplexed and suspicious of it, I have learned with the help of a FIGU member N.W. (from Luxembourg; became Ex-FIGU member since May 2017) that another FIGU member Achim Wolf (moderator of German FIGU forum and also runs the FIGU Germany website) has these older editions. They both, at first, acknowledged the importance of verifying the older publications and agreed to help me, but later they suddenly withdrew because they reported that FIGU has warned them that if they would use these older editions for my investigation, their FIGU memberships would be revoked. Such unwarranted and illogical behaviour by FIGU only made me even more suspicious of their claims. After a few years of search with a lot of setbacks and patience, I have finally found a handful of people, a couple of whom are FIGU members, who have these older edition German contact notes published since 1970’s and 1980’s and other required publications, and also at the same time are willing to take the risk by assisting me with my research. It is incomprehensible for us that Meier/FIGU would burn these original books that purportedly contains the so-called “fulfilled” prophecies and predictions. This (erased) evidence on the other hand has been misleadingly touted as the ‘higher standard of proof than the physical evidence’ by Michael Horn, who apparently either has been kept in the dark about this issue by Meier/FIGU or must have himself deliberately concealed this fact from the public. There is no rationale at all behind burning these original publications just because there happened to be some errors and printing mistakes in them. Was the real reason behind burning those original publications, to conceal the evidence of Meier’s fabrication? Meier and his proponents claim that Meier has accurately predicted the cause of death – ARROW stuck in the back – of a man buried in the Italian Alps about 5,000 years ago and published it in 1991, nearly a decade before scientists discovered it in July 2001 using a chest X-ray and a CT scan taken of the Iceman’s corpse. Even though they didn’t present any evidence for a 1991 publication containing the information, they however presented a scan of a copyright page of contact notes book indicating the purported publication date as 1996, i.e. 5 years before scientists made the discovery. If this were true, it would have been the best evidence either for Meier’s paranormal ability or being in contact with ETs. But as it turns out, when I looked into two different books of the same 1996 edition, I discovered that there was no mention of ARROW at all. It was revealed that the purported 1996 edition which Michael Horn presented in his website as evidence is actually a reprint version that was published after the year 2001, i.e. after the scientists discovered the ARROW in Iceman’s back. When I confronted Michael Horn with this irrefutable fact, he apparently tried to silence me by offering me a free trip to US (where I would be introduced ‘as a scientist’ and have to speak only positively on the Meier case) for not publishing my analysis, which I flatly rejected and went ahead with its publication. Apparently Michael Horn doesn’t want the truth to come out. Was it because he was afraid that it would make his wallet lighter or was there any other reason? I simply don’t know. The responses of Meier or FIGU or Michael Horn so far to our exposé has been either to systematically deny it or suppress it or spread further misinformation or to evade it altogether. Especially Michael Horn, who actively blocks all comments on his blog that even remotely cite our findings and their implications, and at the same time greets people who are skeptical on the accuracy of Meier’s prophecies and predictions and their original publication dates with gratuitious personal insults, instead of engaging in a robust rational debate. After the publication of this ‘Conclusions’ section of this page on January 27, 2016, we have discovered that there is one more striking pattern in Meier’s prophecies and predictions, which we have failed to notice earlier, that most certainly points to a fraud. This pattern has to do with the outright plagiarism of other people’s prophecies/predictions. Also refer to the Miscellaneous section for more new articles deconstructing Meier/FIGU’s claims of the so-called “fulfilled” prophecies and predictions.